Red Rock Canyon National Conservation Area are a series of canyons noted for their sandstone peaks and steep rock walls. The rugged rock formations rise up to 910 m (3,000 ft), making them a popular hiking and rock-climbing destination. You can explore most of this area via the 21 km (13 mi) one-way loop road, from which you can access numerous parking areas, picnic zones, and hiking and mountain-biking trails. Begin with a stop at the visitor center at the start of the loop road. Keep in mind that the trails usually start with an easy to moderate climb and become increasingly difficult as you progress to the top. 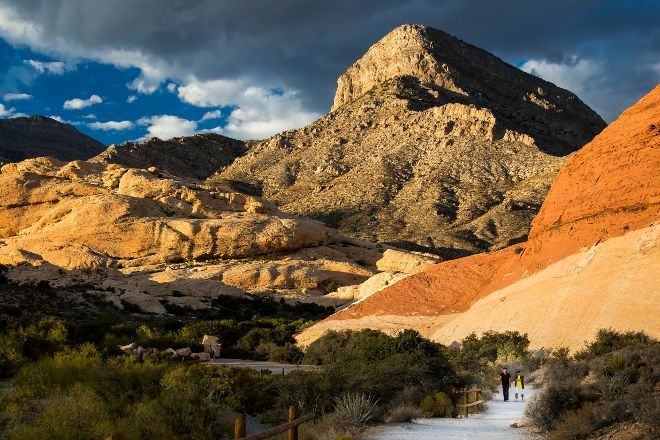 Put Red Rock Canyon National Conservation Area at the forefront of your travel plans using our Las Vegas trip itinerary maker website . This place is absolutely beautiful and surprisingly close to Las Vegas. I drove the scenic loop versus hiking since a) it was 110 degrees and b) solo female traveller (don't feel comfy hiking anywhere solo-especially when I am not familiar with the area). The drive was gorgeous and I stopped at about 3/4 of the scenic lookouts. The visitors centre is great with lots of things to see. The gift shop isn't crazy expensive either. $15 US to get in to Red Rock Canyon conservation area. Well worth it. I went on a Saturday in august and it was quiet enough to always find lots of space to park at each lookout.